FKA Kiteboarding Forums - Islamorada Adventure! We decided to pack up the family and spend a couple of days in Islamorada. There was no wind, so I didn't even bring any kite gear. We were planning on boating on Saturday and kayaking on Sunday. I got in touch with long time friend Brad Lange of Islamorada Watersports and Sevensports about renting a boat. Whale Harbor home of the Islamorada Watersports Company in Islamorada, FL. Brad has organized a bunch of kiting competitions in Islamorada going as far back at 2002. You'll find photo coverage of all of them at http://fksa.org/forumdisplay.php?f=58 Shown above is part of the free style competition in 2009. Whale Harbor the location of Islamorada Watersports Company and kite beach in Islamorada at Mile Marker 84 just over the bridge. Years of great times in Islamorada thanks to Sevensports and a lot of fun competitions. For the first stop of the day I decided to go free diving on the Eagle, an artificial reef sunk in 110 ft. of water to the south. easy navigation and consumes little power too. It is a good idea to keep a weather eye out for shallows and carry a paper chart too. So many vessels have struck in these waters after all, from small craft to large ships going back centuries. things when you can see them from the surface. Helps the quality of the photography too, still you take what you can get. Don't attempt scooter free diving without proper free diving training, skill development and procedures. around in the gap. The vessel although sunk as an artificial reef, ended up on its side. in slightly cooler waters than the Keys. Having a look inside one of the holds forward of the forward of the forecastle. Moving further in, I see what looks like a blast hole through the hull large enough for me to fit through. So I head for it through a school of fish. Here is a clip from that particular dive. I came up on a large goliath grouper tail first on the other side of the hole. It must use it as a bolt hole. For whatever reason I surprised it, creating one very pissed off jewfish. It popped its swim bladder twice and shook its head pretty viscously. Coming out the other side at around 100 ft. staring at the annoyed big fish. The really big ones supposedly have vacuumed up the odd diver. The parable of Jonah may have in fact dealt with such a gastric encounter by some interpretations. 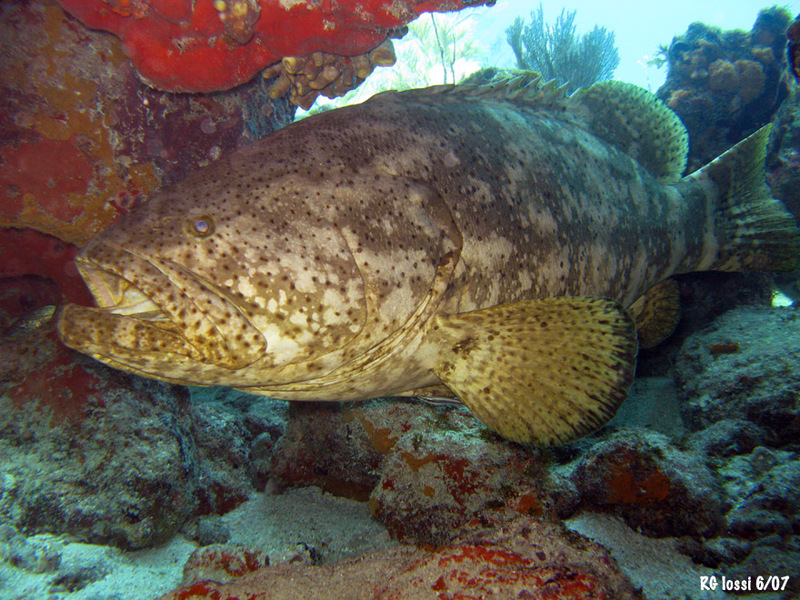 A Goliath Grouper or Jewfish encountered in the Minnow Caves off Key Largo a while back. This fellow was docile despite being in a confined space with me in a cave. Here is another video from a while back free diving with more than a dozen on a wreck. Two of them became really upset making me think about the downside of being inhaled while free diving at 100 ft.? Now we run south to anchor off the Alligator Reef Lighthouse. The lighthouse has marked shallows for the Florida Reef Tract four miles offshore to shipping since 1873. The light is 136 ft. high in sand covered rocky shallows. It contains an accommodation section for the lighthouse crew prior to 1963 when the light was automated. Who is up for weathering a Cat 5 hurricane in white iron sardine box of this baby? Anchoring up near the lighthouse, momma and baby go in to cool off. An illustration from Harpers Weekly. The schooner of war, USS Alligator had some interesting times too. It was commissioned by President Monroe in 1820 to suppress the slave trade in Western Africa. It was the shifted to suppression of piracy in the Straits of Florida and nort...hern Caribbean in 1822. Pirates were running rife plaguing shipping in the area at the time. The ship fought a successful action off Matanzas, Cuba but its Captain was killed in the exchange. The ship then sailed in convoy from Cuba bound for Norfolk, Virginia. The 83 ft. schooner had a whopping draft of 11 ft. with the waters of the reef tract in the area being 5 ft. or less. The ship struck the reef in the night in 1822 and was kedged to attempt to haul her off in the morning. The line parted and she blew further on to the reef. Despite shifting weight overboard and to a Bahamian salvor the vessel floundered hard aground. The men were shifted to another naval brig and the vessel torched to avoid salvage by pirates. Powder stores detonated and the vessel exploded. You can dive the remains today. I decided to checkout the area beneath the lighthouse. Tons of old iron pipes used in the structure of the lighthouse have been dropped there. I understand there used to be a bunch of old batteries down there too, no longer however. Back at the boat BG and mom hang out. A skate, skates by the boat on the bottom. Lots of fish beneath the tower. I came across some nice images of the lighthouse and have reproduced them here. The fellow captured unusual lattice work structure of the lighthouse. I understand the pipe piles were laboriously driven ten feet into the coral of the reef tract by steam equipment back in the day. The view out the door to the lamp area. This guy got some intriguing shots from the lighthouse. Still swimming around under the tower shooting with a Quikpod monopod to gain some different perspectives. Moving on up Keys to Conch Reef for some more diving. I read that there was a prominent wall dropping about 50 ft. there which is a rare thing in SE Florida. boats most weekends. Here is an ultralight landing by the boats along the sand bar. We move on up keys to Conch Reef and anchor on a mooring ball for more scooter free diving. There seems to be less of a wall at Conch Reef and more of a slope. This thing resembles an artificial reef there is so much growth on it. One more annoyed goliath grouper. They always seem to be miffed, where is the love? We motor back towards Whale Harbor and a snorkeling spot along the way. I find a nice shallow dive on the way back for mom and baby to checkout, "Hen and Chickens." There is a lot of prolific growth here. Navonics makes finding these spots easy fortunately. We pull anchor for the last time and head back to Whale Harbor Marina. Good night from the Keys following a really great day! Thanks Brad for a great day on and under the water for the whole family!!! These guys are long time Conchs or Keys residents and can take you to a lot more great spots than the few that show up in this account. Why not spend some time in the Keys? Tomorrow we head out to Indian Key just offshore in the Straits of Florida via kayak. You can rent kayaks at Brad's operation Robbie's marina to tour the island or paddle through green tunnels and grottos in the picturesque mangroves nearby. The island sports a lost settlement washed away from view through a seminole indian raid of 130 braves, killing 13 inhabitants and burning the buildings in 1840. Add in numerous severe hurricanes and storm surges and today, not much left today other than some rock foundations and a sense of lingering spirits from times past. The island was formerly the county seat and base of operations for major salvors working the wealth of wrecks striking the reef tract of the Florida Keys in the early 1800's. Sea going ghost stories anyone ... ? A more realistic view of the island. This engraving was reproduced in other form in "Harpers Monthly" Feb. 1887 in the serial publication "Along the Florida Reef" authored by Dr. D.B. Holder. Anyone planning to hit the Keys for some water time wind or no? looks like fantasy fest for us this year. never been. Rick, I totally enjoyed your pics! Have fun down there Phil, hope you have some good wind too at the same time. Thanks, love spending time in the Keys! Lucky you, that is about the only easy north wind spot on Key West. I checked it out online earlier in the year for some strong frontal winds but concluded that without a military ID I wouldn't get on the island. Hope they don't sell it either and have fun down there. Actually kited the last 2 mornings here in Islamorada. Yesterday on a 12m and today on a 17m. Always bring gear! If all else fails, head to Keys Cable at mm 59 or paddle boarding and wakeboarding with Otherside Boardsports! Glad you got out! Still the forecast is light up here (5 to 10 kts. ), a little better down your way on Sunday. It is supposed to nuke at 10 to 15 kts. So, if you're heading down take your big boards and kites and you might get some wind time in. Why not throw in the diving, a trip to the lighthouse, some kiting, cable park and hang gliding too (if Paradise HG is still at Whale Harbor?). No end of stuff to do in the Keys. There is a webinar tonight with some good content on this low cost but powerful smart phone/iPad navigation aid. 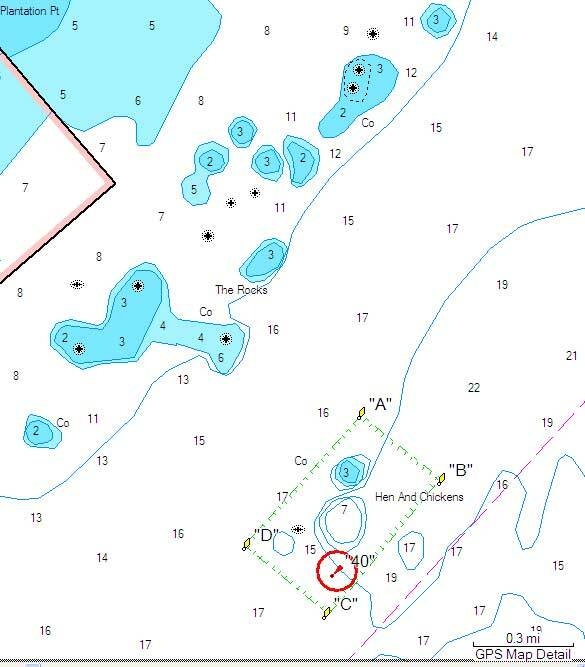 Join me tonight at 7pm for a Navionics Webinar with Jessica Anderson discussing Diving South Florida Shipwrecks by clicking on the link above and registering."